When Great Britain’s male gymnasts start their qualification competition, their star turn Max WHITLOCK will already know how his closest rival on pommel horse fared earlier in the day. Rhys McCLENAGHAN of Ireland, who won gold in this event at the Commonwealth Games in April ahead of WHITLOCK, competes in an earlier subdivision, starting at 14.00. The defeat of the Olympic and world champion in Australia took many by surprise, although to be fair, both gymnasts earned the same score. McCLENAGHAN won the gold on a technicality – his execution score was higher than WHITLOCK’s, and was used to break the tie. WHITLOCK’s qualifying competition will be finished in just over half an hour on Thursday evening. 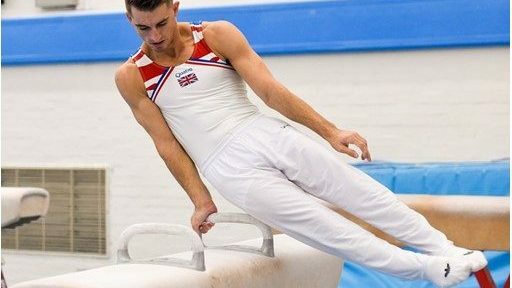 He is competing only two routines, floor exercise and pommel horse, and they are the British team’s first two events. As well as his personal goals to reach both floor and pommel horse finals, WHITLOCK’s scores will also contirbute to the team effort. Barring any major calamity, a top eight finish, and qualification to the team final, is well within the team’s capability. Russia beat them into second place in the last two European team finals (in 2014 and 2016), so they are clearly the team to beat. WHITLOCK is also aware that the home advantage, in a venue where he has seen previous success (three gold, a silver and a bronze medal at the Commonwealth Games in 2014; gold and two silver medals at the world championships in 2015) could give the British team the edge. Although he sees these European championships as a significant event in their own right – particularly as they are part of the first multi-sport event of its kind – WHITLOCK has a long term strategy far beyond these championships. “Every competition is a stepping stone for the next one that’s coming up. That’s the way I look at it,” he said. He is not just talking about the upcoming world championships in October, the first qualifying step on the route to the 2020 Olympic Games in Tokyo. “I’m hoping to carry on for another six years,” the 25-year-old said. That would take him to the 2024 Olympics in Paris, which would be his fourth Olympic Games. His Olympic career began when he was just 19 in London 2012, where he won two bronze medals – team and pommel horse. His big triumph came four years later in Rio, with gold medals for floor exercise and pommel horse and a somewhat overlooked, but mightily impressive, bronze all-around. Men’s qualifications start at 10.00 with subdivision one, followed by subdivision two at 14.00 and subdivision three at 18.30 at The SSE Hydro on Thursday. The team final is on Saturday and apparatus finals are on Sunday.